Glass Heart (Bells for Sylvia Plath). Jenny Olivia Johnson. 2013. In May, Sophie Maddocks, recipient of the 2016-17 Fulbright Postgraduate Award at the New School, visited the One Life: Sylvia Plath exhibition at the Smithsonian National Portrait Gallery. Here, she discusses Plath’s visual imagination, the American writer’s time as a Fulbrighter in Cambridge, and reflects upon the end of her own Fulbright experience in the US. My time as a Fulbright Scholar is rapidly approaching its end. I’ve submitted my thesis, sent my belongings back to England, and said goodbye to friends and colleagues. During these last few days, I’ve also addressed a task that has been lingering on my to-do list for too long. 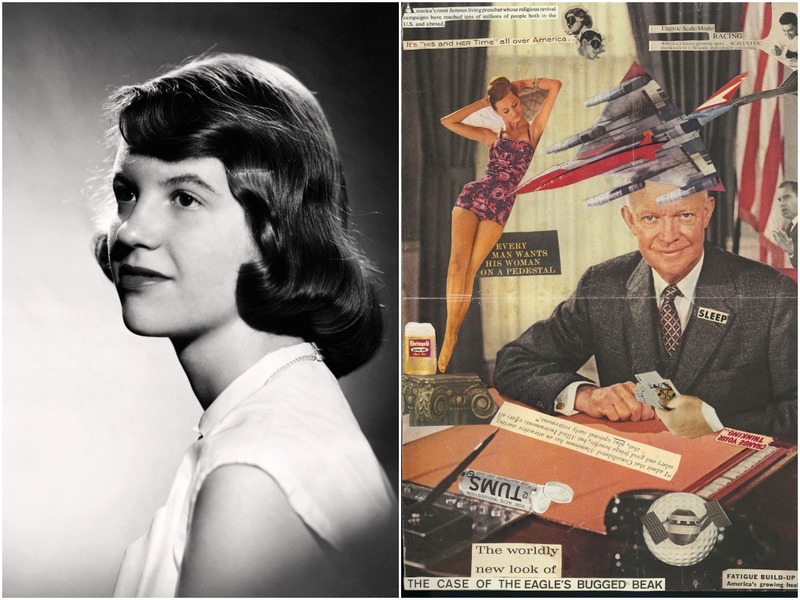 To celebrate the 70th Anniversary of the US-UK Fulbright Commission, I have been invited to revisit the life of my favourite Fulbrighter, Sylvia Plath. Sat in an empty Brooklyn apartment, I pick up a copy of Plath’s Unabridged Journals and find instant reassurance in her words. I begin to unpick the mass of conflicting emotions that I’ve been suppressing towards the end of my time in the United States. For 60 years, Plath’s writing has guided so many of us through our Fulbright journeys. In fact, it is in learning about Plath’s life that many scholars came to read the word “Fulbright” for the first time. Plath’s work has inspired countless young artists, writers and media makers to pursue Fulbright Awards. So, as well as marking the Commission’s 70th Anniversary, this account of Plath’s Fulbright experience is also a fond farewell to my own. My exploration of Plath’s Fulbright journey began in Washington D.C., where the Smithsonian’s National Portrait Gallery put on an exhibition dedicated to Plath’s life. Earlier this month, Fulbright scholars, staff and alumni enjoyed a private tour of the exhibition by its curator, Dorothy Moss. The exhibition, titled One Life: Sylvia Plath reveals how Plath shaped her identity as a writer in the 1950s and early 1960s. 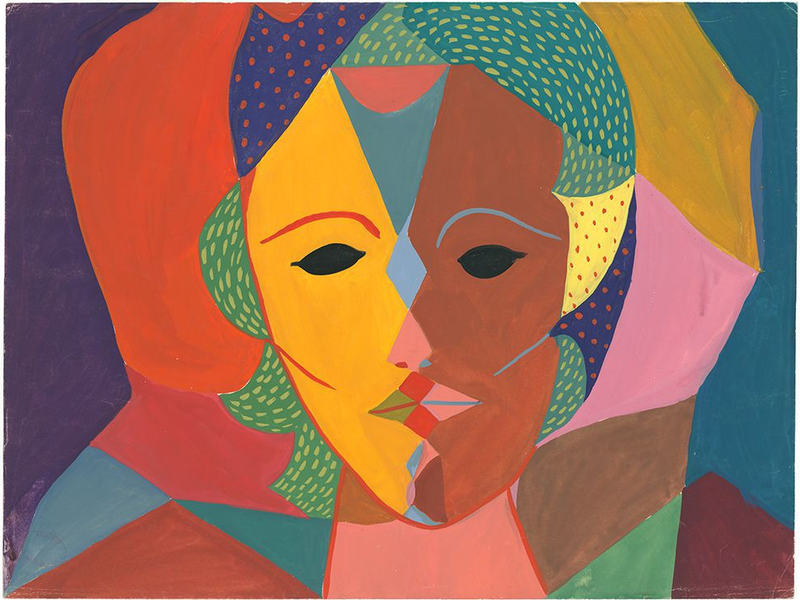 It is the first ever exhibition to focus on Plath’s visual imagination, and it includes examples of her experimentation with portraiture and collage. Upon entering the gallery, I was met by seven bell jars suspended in the center of the room. 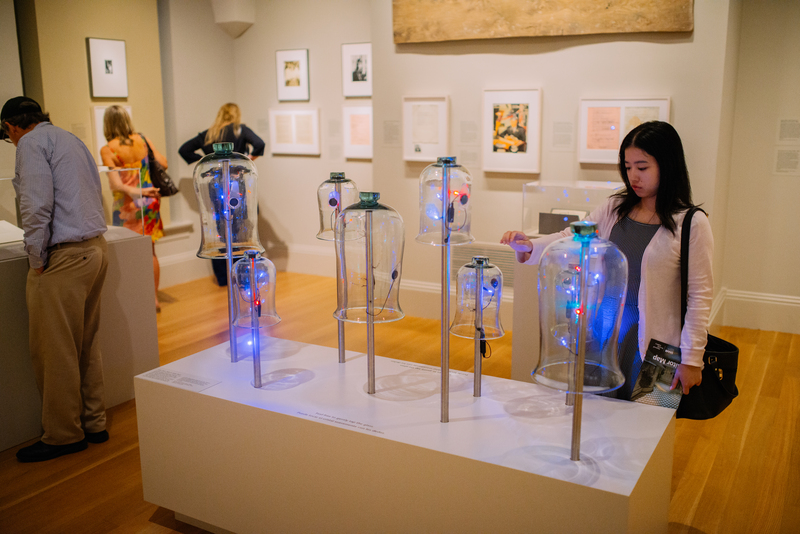 In this interactive installation, the jars are lifted up, suspended in mid-air, and filled with vivid lights and sounds upon each visitor’s touch. The exhibition is ordered chronologically, beginning with childhood photographs and Plath’s earliest drawings. As I moved through the gallery, the rudimentary sketches of Plath’s childhood made way for more accomplished pieces from her time as an undergraduate at Smith College. During Plath’s first year at Smith she took introductory Art classes and began experimenting with portraiture and photography. Two photos of Plath hang in the gallery from around this time. 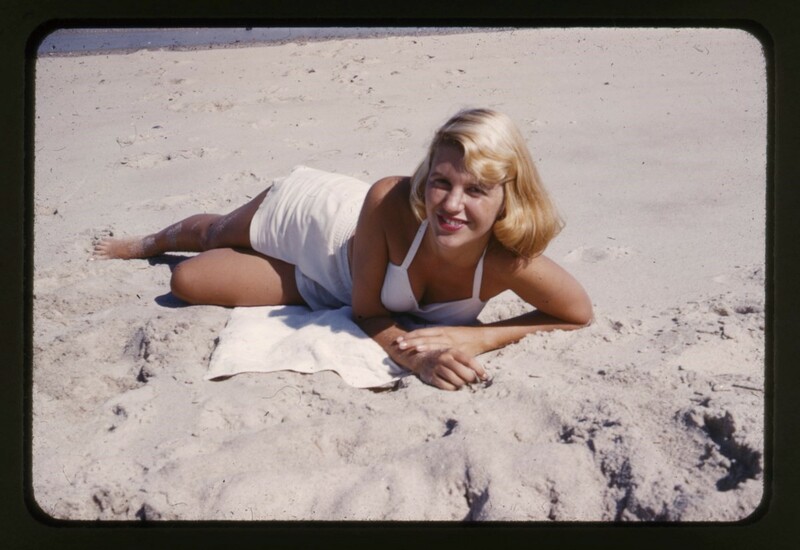 One shows her lying on a beach striking a “Marilyn” pose in a white bathing suit with bright blonde hair. In the other, she has dyed her hair brown and refashioned herself to appear more studious for her Fulbright Interview. Triple-Face Portrait. Sylvia Plath. c. 1950-1951 Courtesy The Lilly Library, Indiana University, Bloomington, Indiana. Sylvia "Marilyn" Shot. Gordon Ames Lameyer. June 1954. Courtesy The Lilly Library, Indiana University, Bloomington, Indiana. As a student of Media Studies, I was struck by this savvy use of visual media. As well as reinventing her own image, she also used collage to critique world events. Her visual style combined with her confessional prose felt decades ahead of its time. Her journals read like contemporary feminist blogs, and her collages remind me of today’s popular political meme accounts on Instagram and Tumblr. This led me to search for Sylvia Plath across social media platforms, and I found regularly updated Instagram accounts dedicated to her life with tens of thousands of followers. Much of her work has been carefully curated across these platforms. Her poetry is clearly as relatable as it was 60 years ago, and the way young people creatively reformulate her work in online spaces is testament to that. Left: Studio photograph of Sylvia Plath (with brown hair). Warren Kay Vantine, 1954. College Archives, Smith College, Northampton, Massachusetts. Right: Collage (Includes images of Eisenhower, Nixon, bomber, etc. Sylvia Plath. 1960. Mortimer Rare Book Collection, Smith College, Northampton, Massachusetts. Another artefact from Plath’s Fulbright journey that drew my attention was a letter of recommendation from her psychiatrist. During her time at Smith College Plath was hospitalised after experiencing a psychological breakdown, and she was concerned that her time in hospital would prejudice her application. Her psychiatrist’s glowing letter of recommendation did quite the opposite. In her description of Plath’s character, her psychiatrist identified many of the qualities that today’s Fulbrighters seek to emulate: “She is singularly free of conscious privilege (against racial or religious groups, for example) and is quick to spot any unreasonable attitudes in herself”. The letter concluded by addressing Plath’s mental illness directly: “Her chief fear is that having had an emotional upheaval sufficiently severe to provoke her hospitalisation will be held against her as evidence of basic instability. While in many cases this might be a valid conclusion, in the case of Miss Plath, I feel that anyone refusing her a position on these grounds would be depriving not only Miss Plath, but also depriving themselves". Plath joked that she was probably the only applicant with a letter of recommendation from a psychiatrist. Perhaps if shared more widely, this letter could spark a conversation among Fulbright grantees, alumnae and board members, about the mental health barriers that deter some applicants from pursuing Fulbright awards today. Plath undertook her Fulbright Scholarship at Newnham College, Cambridge. The writing and photography featured in this section of the gallery encapsulates the excitement and joy experienced by so many Fulbrighters when they make that liberating leap to a new country. The journal entries, poems, and letters displayed in this part of the gallery depict Cambridge as a blissful bubble, a suspension of reality during which she could write without limits. Plath also became very entrepreneurial during this time, regularly sending her poems to journals and magazines. Perhaps it is being labelled a ‘Fulbrighter’ that instills in many of us a greater belief in our own capabilities. And in turn, this self-assuredness leads us to reach even greater heights. I am returning to the UK during the US-UK Fulbright commission’s “Month of Action”, in which Fulbrighters across the UK and US are volunteering in their communities and raising awareness about Fulbright programmes. 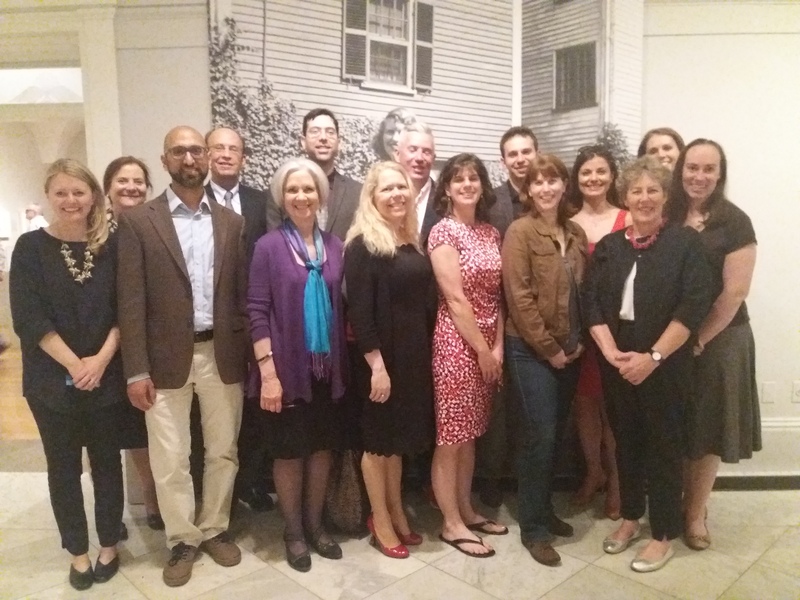 Over the last two years I have met so many grantees who are furthering Plath’s legacy by using the Arts to seek solutions to despair and find meaning in our shared human experiences. My next chapter will begin with this month of action. In spreading the word about Fulbright programmes, I hope to seek out those creatives who will continue building - and reimagining - Plath’s enduring legacy. For the last two years Sophie Maddocks has been living in New York City pursuing a Master’s degree in Media Studies as a recipient of The New School & US-UK Fulbright Award. Her interests span youth media education, online safety and cyber civil rights. Sophie is a former Teach First teacher and fundraiser for The Sutton Trust. During her time at The New School Sophie has worked on a range of multimedia projects and youth work programs.